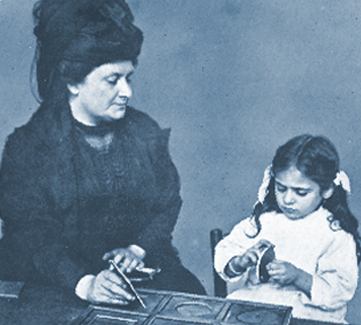 Born in Italy in 1870, Dr. Maria Montessori became her country’s first female physician. By age 36, Dr. Montessori was a medical doctor in philosophy, psychology, anthropology, and medicine. Through her medical training, she developed a keen interest in diseases in children and in the education of “special needs” and mentally challenged children. Maria believed that any child could be taught with the right approach and environment. Her passion for children and their well being prompted her to open a school for underprivileged children with special needs–complete with child-sized furniture and specially designed materials that focused on the needs of each individual child. Within months of opening her school, these seemingly “uneducatable” children developed discipline, concentration, respect, and a sense of joy about themselves and their environment. They slowly became self-directed learners who worked well independently and as members of the overall group. Thus was born the core of the Montessori Method of education that we still practice today. Dr. Montessori gives a lesson in touching geometrical insets. To learn more about Dr. Montessori and the method named after her, we invite you to visit The Montessori Method by Dr. Maria Montessori on line.